Sometimes it is wiser to heed the warnings that to tempt fate. 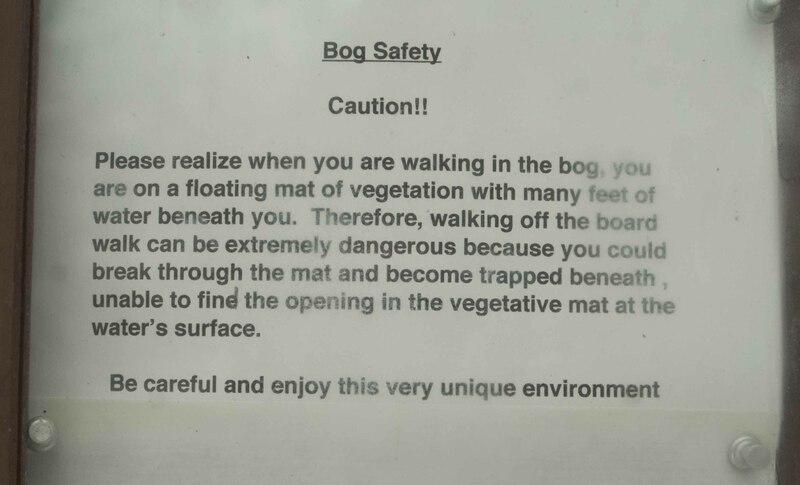 Much like staying off the roads during a blizzard or other major storm, this bog warning seems one to pay attention to. I have no interest in becoming a future archaeologists find, and getting a quippy name like “Bog-ena” or “Find #62179a in Ponemah Bog”. Could just be me though, but that seems like an unfortunate way to achieve immortality for not giving due consideration to a posted warning. And so, I will stay on then boardwalk. I will also stay off the roads while the blizzard winds down. I have plenty of books to read and food to eat, so all is well. We got snow yesterday and overnight, albeit just a small amount. However, since temperatures are on the rise I wanted to get back to the bog from last week and see how it looked. Once again it was very quiet, just the squeak of my boots and some birds chirping. The snow had just dusted the boardwalk and grasses, and piled up on some branches. I walked the same route as last time, but had planned to do the full loop on this hike. The viewing platform made such a nice graphic image against the snow and bushes that I didn’t want to step on it. The pond had just a skim of ice on it and a mist over it softening the scene. Then I headed down the second part of the loop and much to my surprise there was a side trail! So, I took it to explore what it had to show. The scenery was lovely and very rough in a windblown type of way, as if everything grew battling the forces of nature. look back at where I’d been. Something that is good to do so you see the progress you have made. It gives you a good sense of your journey even if it was just an unexpected side trip on it. A last view of the pond before heading into the cover of the woods and ending the hike. It was the perfect morning to be out, the snow was still fresh and yet the temperature was not too cold. I took so many photos that I didn’t use here that will appear in future posts.